Nobody likes a wilted sunflower! With these sunflower facts and sunflower care tips, taking care of sunflowers is easier than ever. 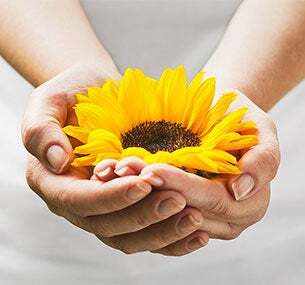 Sunflower care is as easy as plant, water, and watch! Your sunflower will grow to new heights with these simple tips. Your sunflowers may arrive in bud form. Follow these simple tips for maximum quality and enjoyment. With proper care, your flowers will continue to open up and bloom for several days. Fill a clean vase 3/4 full with fresh cool tap water and flower food. Remove bottom leaves if present. Cut one inch off the stems under running water and immediately place in vase. Re-cut stems and change water on day 3 for longevity and optimal outward appearance. Keep flowers away from drafts, direct sunlight, and excessive heat or cold. 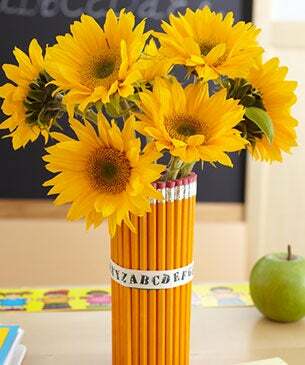 1 Place a rubber band around a glass vase and insert unsharpened #2 pencils between the glass and the rubber band until the entire glass is covered. 2 Hide the rubber band with a ribbon of your choice. 3 Pour about 2 inches of water into the glass, but make sure to add more water right away so that the flowers stay fresher longer. 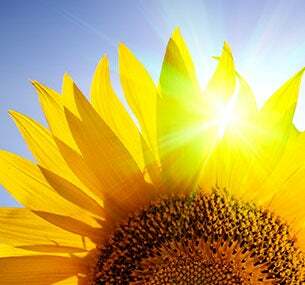 Sunflowers follow the path of the sun as they grow, and it's natural for them to bend and twist at they do so. To ensure every petal receives as much sunlight as possible, our striking stems are grown on farms with optimal temperature for harvest. Give them a big gulp regularly to ensure that they'll grow to be full, lush blooms. Once the sunflower seed settles in an ideal spot, the sunflower life cycle will start all over again. After a long season, the petals will start to wilt. Eventually the whole flower will shrivel, where the seeds will then be released and scattered in the ground. 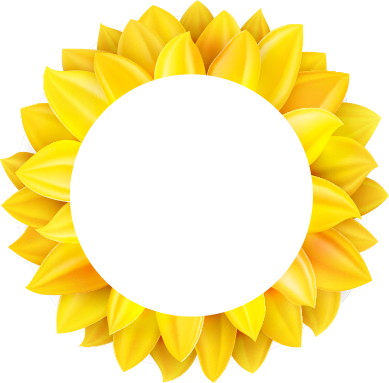 The first phase of the sunflower's life cycle is as a seedling. About 3 days after the seed is planted, it germinates and the case begins to split as the roots shoot out and push further down into the soil. Finally, as the flower head opens fully, the beauty of the sunflower can be appreciated at its prime. After about a week, a shoot will sprout out of the soil, reaching slowly for the sun. Shortly after the shoot appears, the leaves will begin to open; the stem and leaves will continue to grow larger and wider as time continues. As the seedling continues to grow, eventually, a bud will be noticeable. The bud will begin to slowly unfold as the flower head opens.